The valley once was an important trade route from India to Tibet, which explains a ubiquitous and fascinating mix of Hindu and Buddhist influences in local beliefs, architecture, and food. Historically the valley was settled by the Newars, a tribe of Indian and Tibeto-Burman origin. 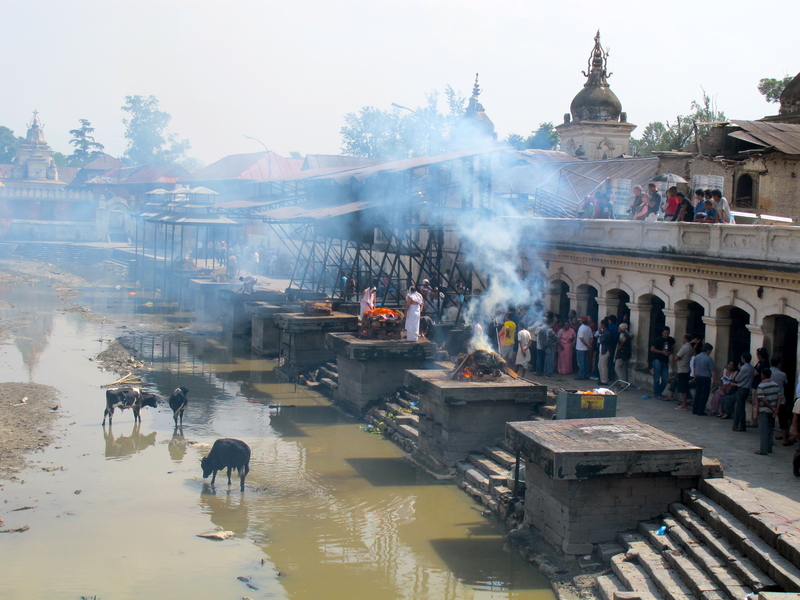 “Nepal” and “Newar” are phonetically different forms of the same word. Due to modern migration, however, today Newars constitute a minority in their ancestral homeland. 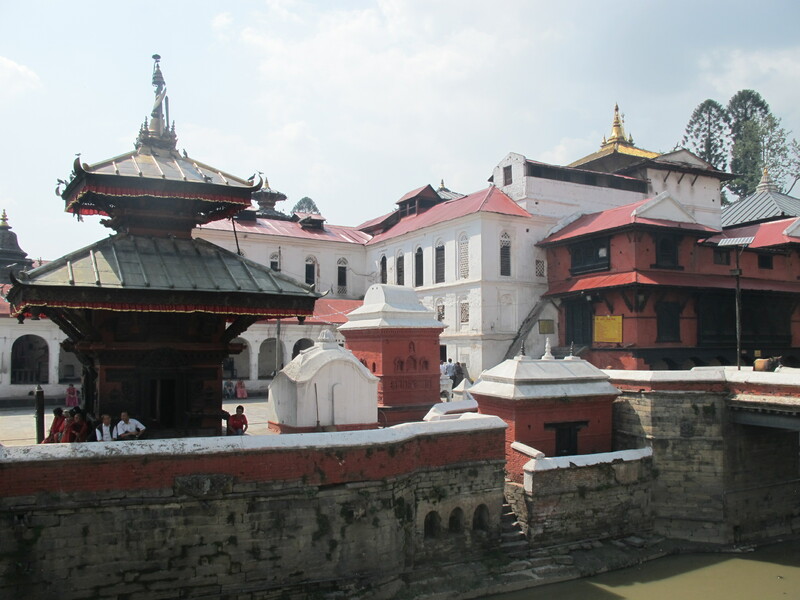 Their golden age came in the 17th century and that is when most of Nepal’s iconic structures date from. 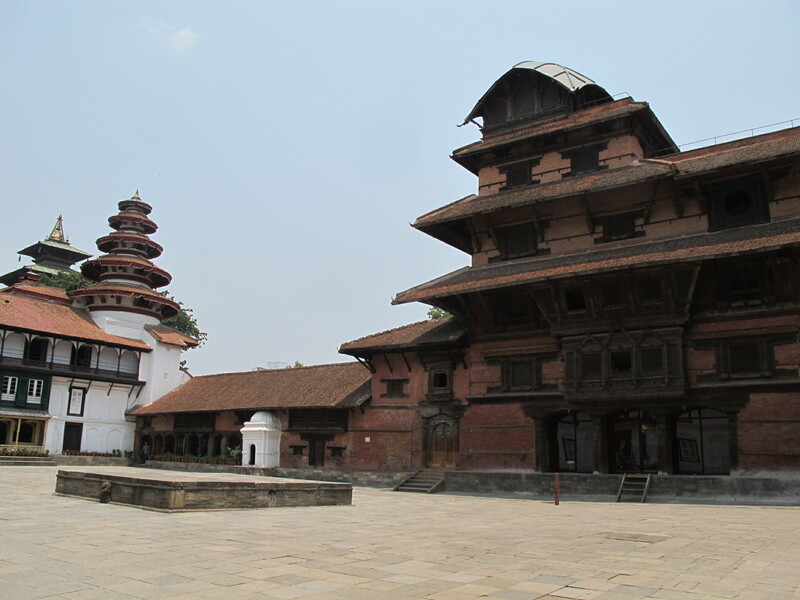 At the time the Kathmandu Valley was dominated by three rival city-states ruled from the 12th-18th century by the Malla dynasty: Kantipur (today Kathmandu), Lalitpur (Patan), and Bhadgaon (Bhaktapur). 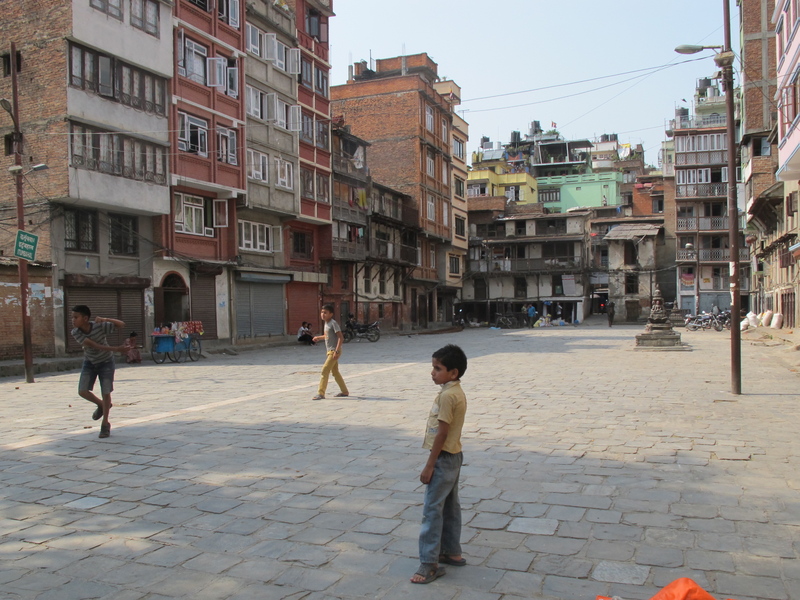 Their competition for greatness is evidenced in each city’s magnificent Durbar Squares (“durbar” means palace) with the respective royal palaces and countless temples clearly trying to outdo each other in size and opulence. 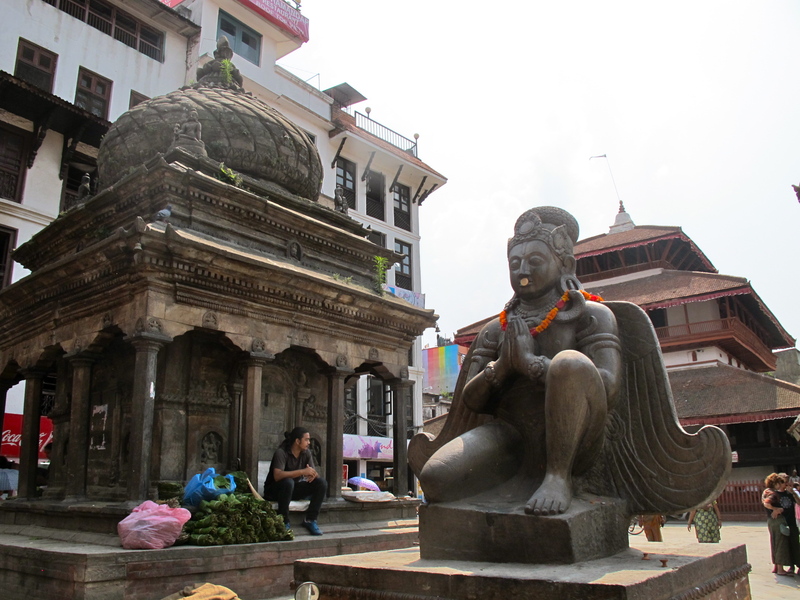 The rivalry ended when Gorkha king Prithvi Narayan Shah managed to unite Nepal in 1768-9 and Kathmandu gained its lasting supremacy that made it the country’s prime metropolis. 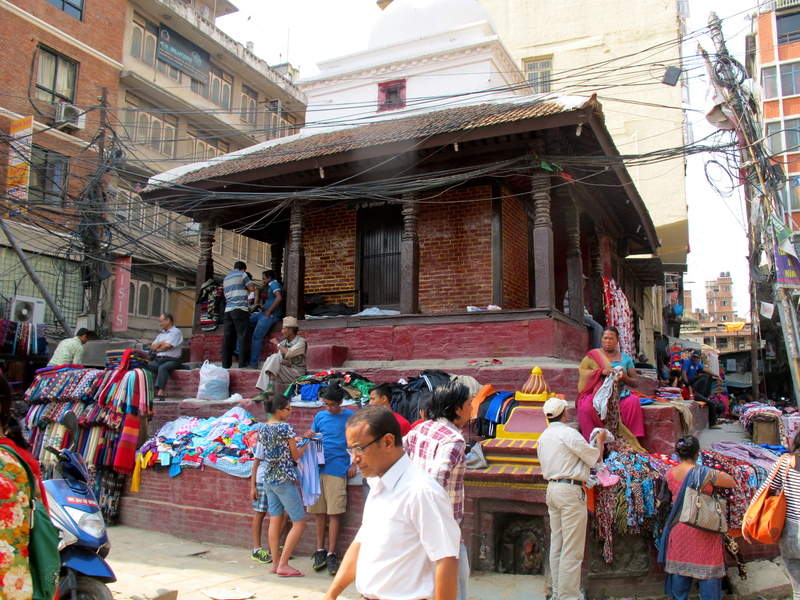 I will talk about Patan and Bhaktapur in parts 2 & 3 of this blog, devoting this one just to Kathmandu and places in the immediate vicinity. 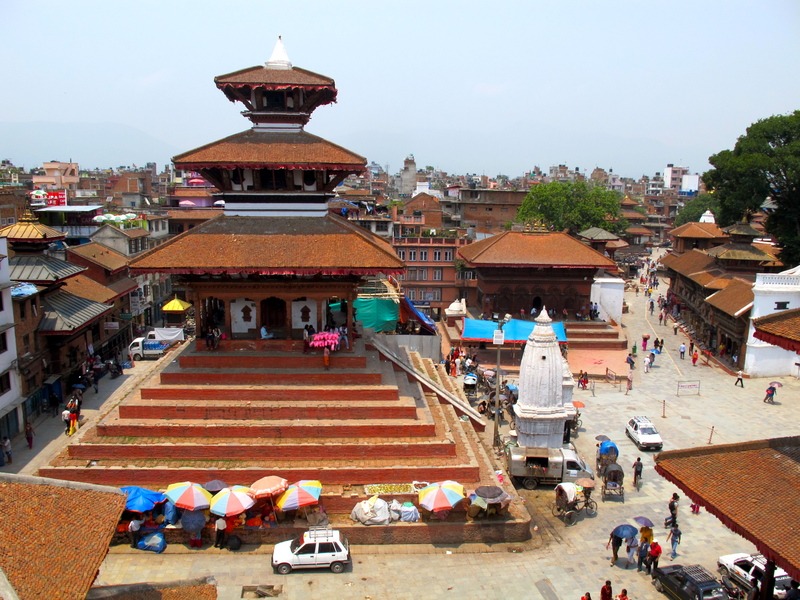 Let’s start with the heart of Kathmandu, its tourist mecca Thamel and the amazing Durbar Square. 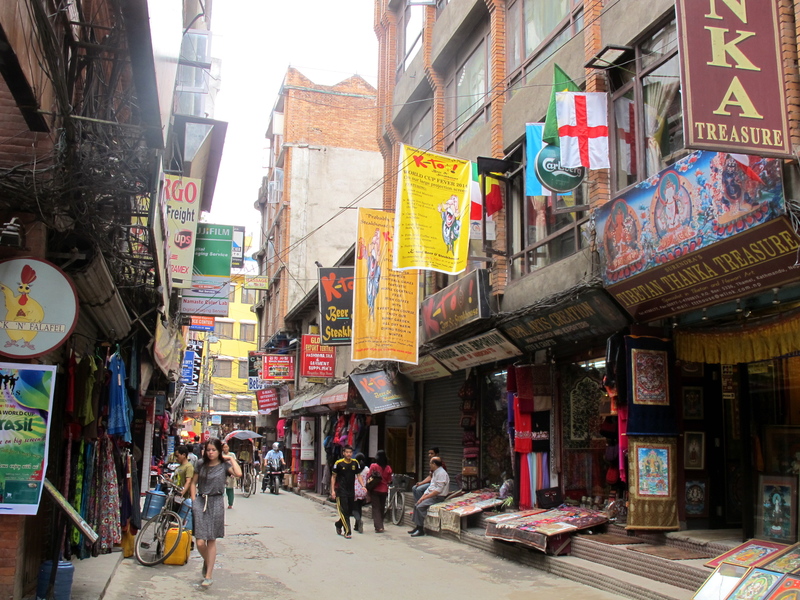 Thamel is Kathmandu’s prime tourist district rivaling Bangkok’s famous Khao San Road. 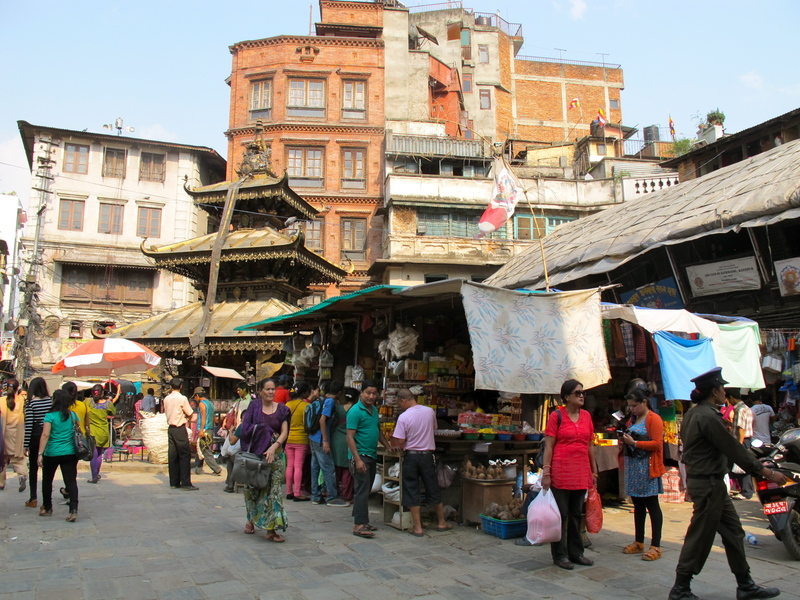 Here you’ll find everything from cheap accommodations, countless souvenirs, to great food (like delicious local dumplings, momos, at the Thamel House restaurant for example). Hundreds of similar atmospheric squares with adjacent teahouses, and temples are scattered across the city, perfectly intertwined and absorbed, as though through some strange process of osmosis, into the urban din. 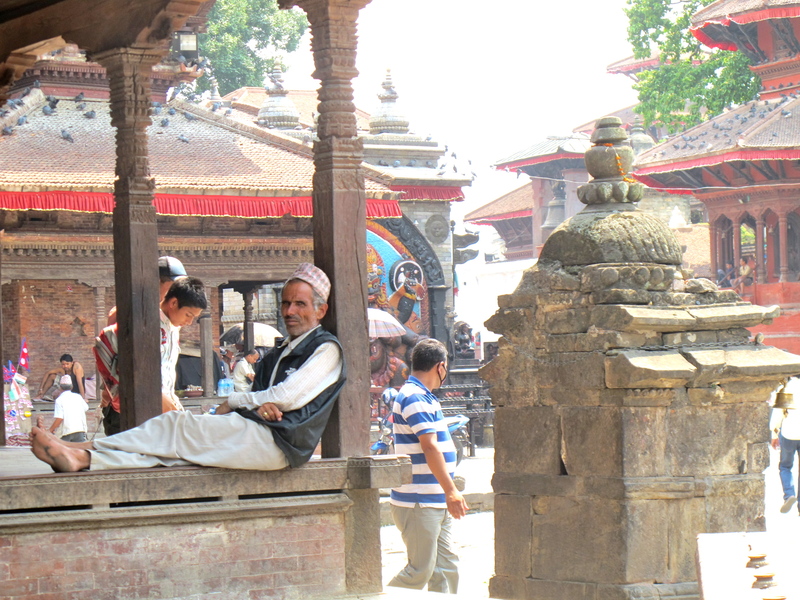 In fact, many serve the dual purpose of religious devotion and trade conducted right there on the temple steps. Finally we reach Durbar. Stunning! 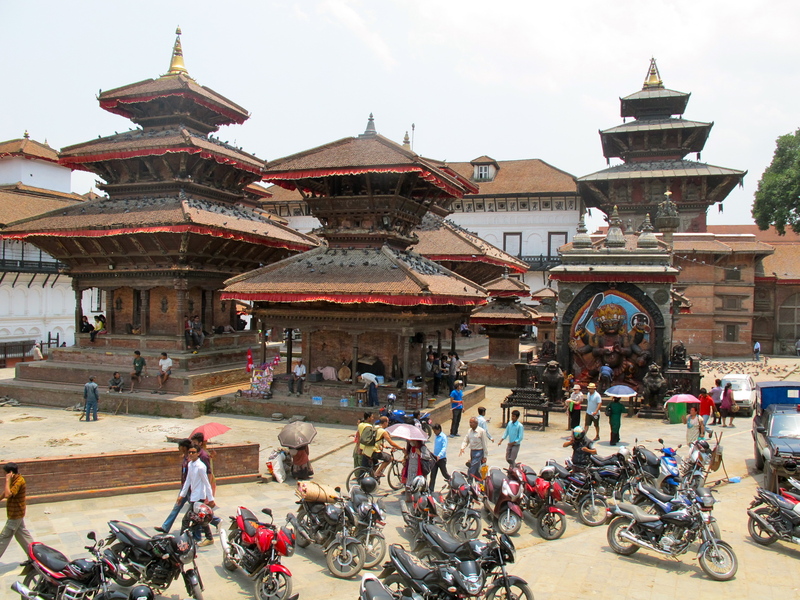 Durbar Square is hard to grasp with a camera lens and hard to describe – I simply have not seen anything quite like that before. 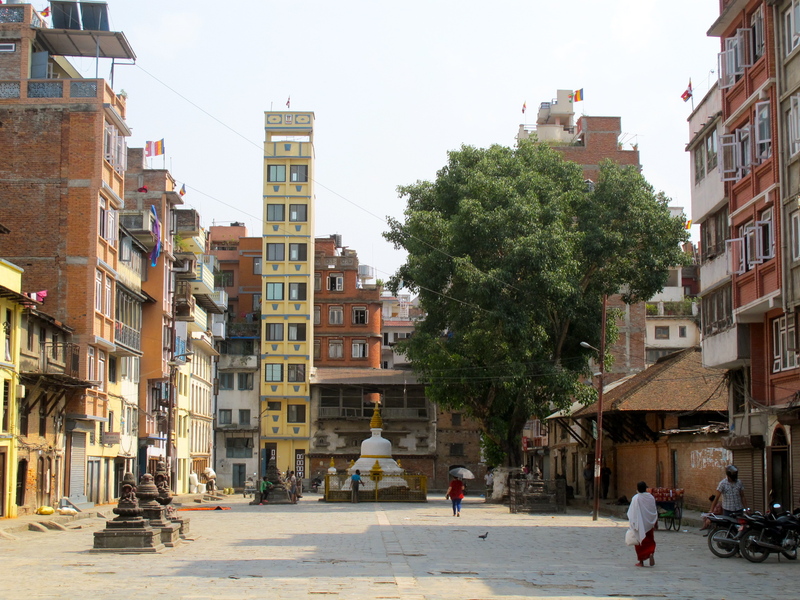 The square surrounds Hanuman Dhoka, the royal palace where Nepali kings lived until about a century ago when they moved to the modern Narayanhiti palace. 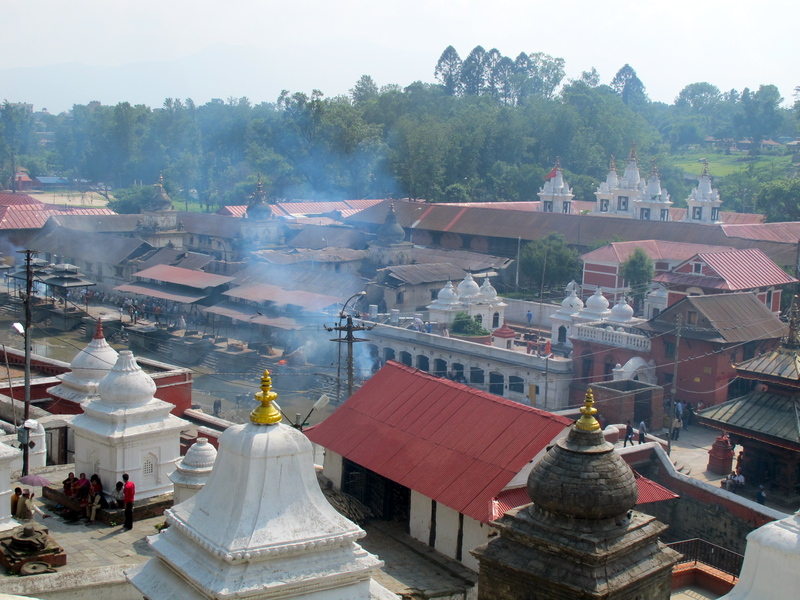 The view is unmatched: temple after temple after temple, one more gorgeous than the other… The temples rise up on platforms supported by four steep staircases, most have tiered red-brown roofs reminiscent of mountain peaks, and all simply overflow elaborate wooden carvings (some R-rated) and statuary devoted to the deity they are dedicated to. 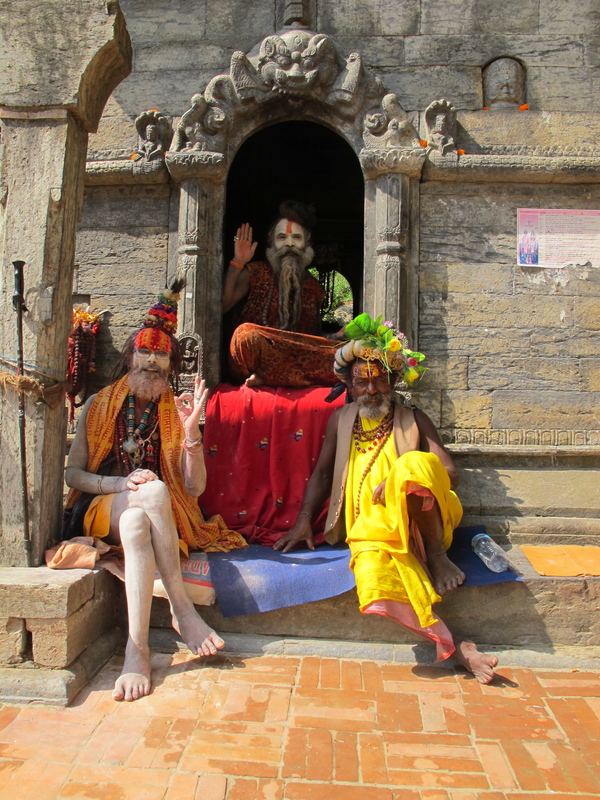 Nepal’s history and unique cultural flavor come alive here and the gods seem so much closer somehow… In fact, one of the goddesses, Kumari, lives right next door. Kumari, similar to Tibet’s Dalai Lama, is a child – a young girl in this case – chosen according to strict criteria under a Newari religious tradition to reside and be worshiped in an opulent house on Durbar Square until she reaches puberty. She is believed to be the incarnation of the goddess Taleju until she menstruates (or suffers other dramatic loss of blood). 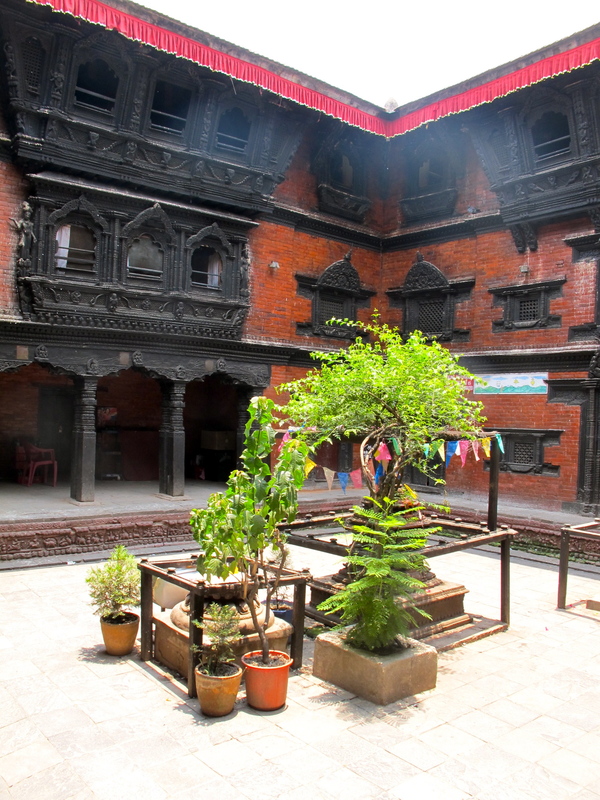 The courtyard of her house is a small oasis of peace in the bustling square. Even if you’re not an expert on Hindu deities, temples can be usually easily identified by images of the creatures that respective gods use as modes of transportation. Nandi the bull guards Lord Shiva’s temples, winged Garuda always accompanies Vishnu, and a mouse is the mount of elephant-headed Ganesh. 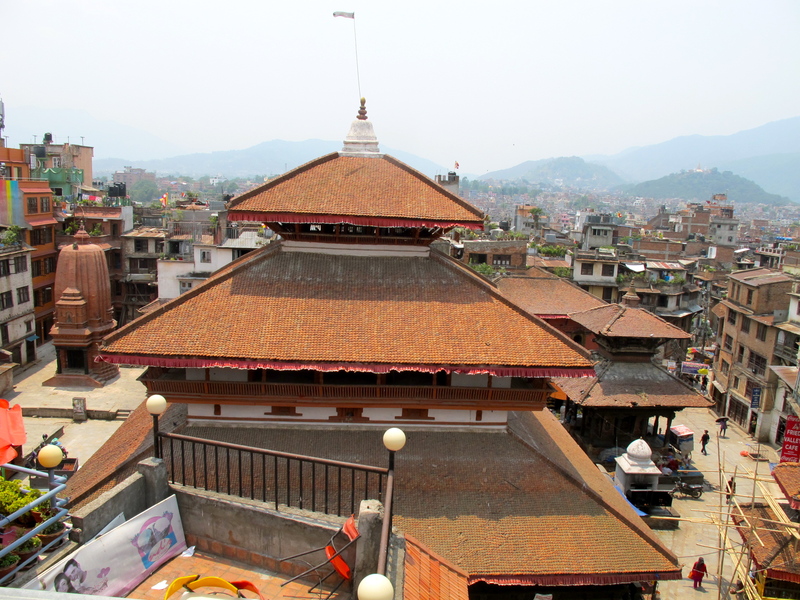 For a different vintage point duck into one of the many cafes at Durbar that has a rooftop terrace to enjoy views like this one of Kasthamandap temple after which Kathmandu takes its name. 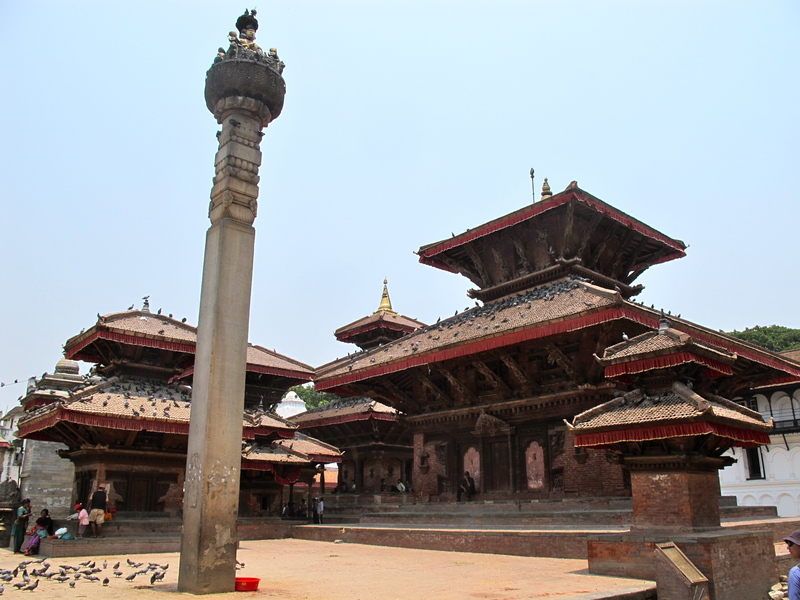 Legend has it that the temple was built in the 12th century from the wood of a single tree. 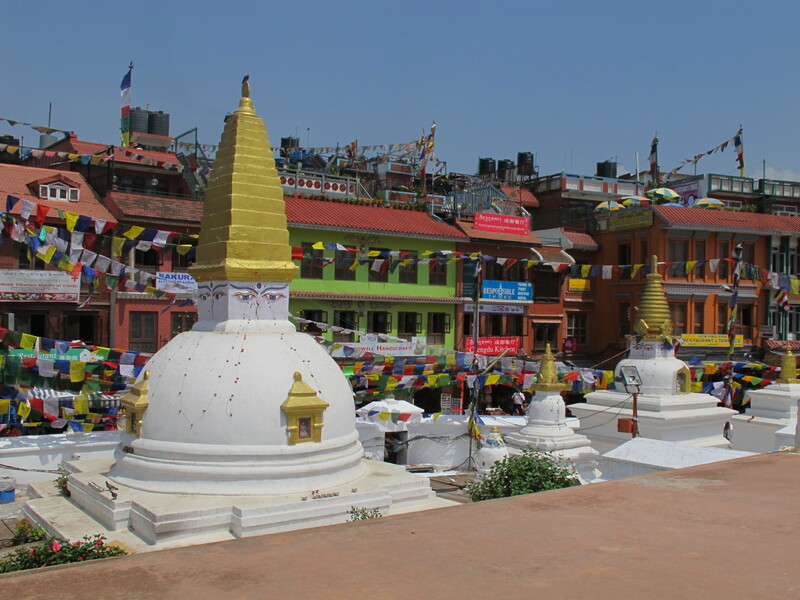 Look beyond the rainbow-colored roofs and walls of Kathmandu houses and you will see our next destination, Swayambhunath (aka Monkey) Temple. 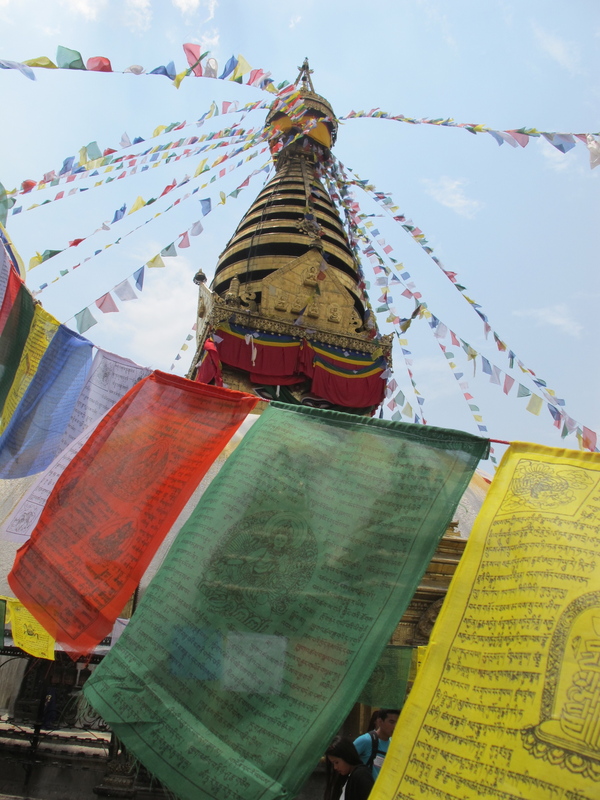 A Buddhist temple of Swayambhunath, where monkeys famously seem to be in charge, provides iconic views of Kathmandu. 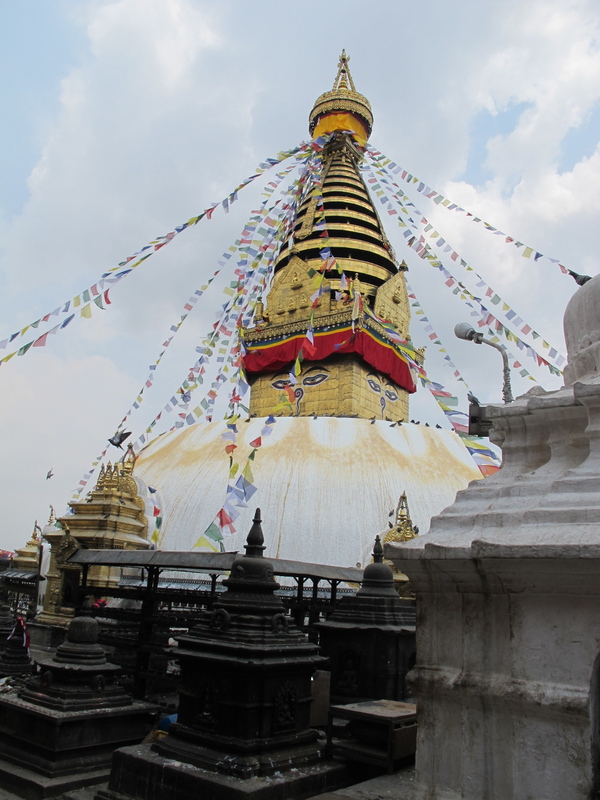 According to the legend, now supported by geologic evidence, the valley was once a lake and Swayambhunath (meaning “self-arisen”) rose spontaneously above the waters. 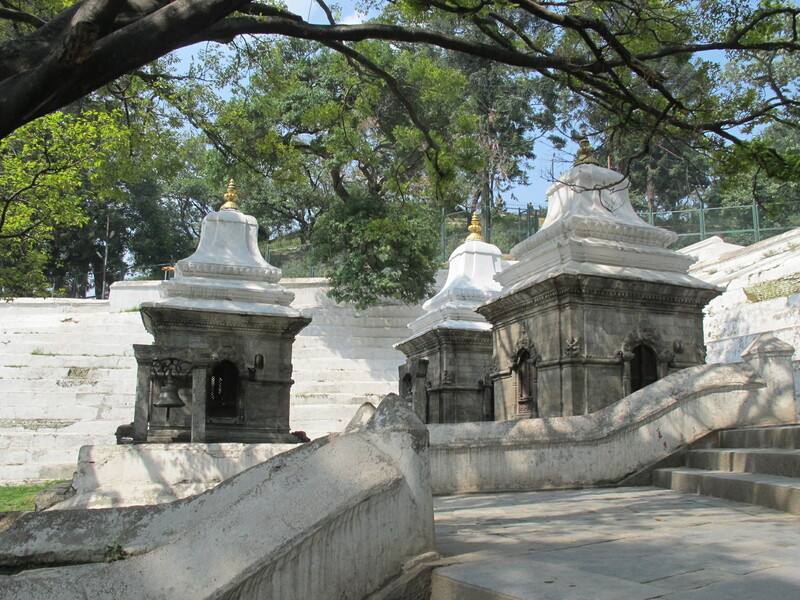 The temple compound on top of the hill can be reached by a stone pilgrim stairway – a cathartic experience in and of itself. 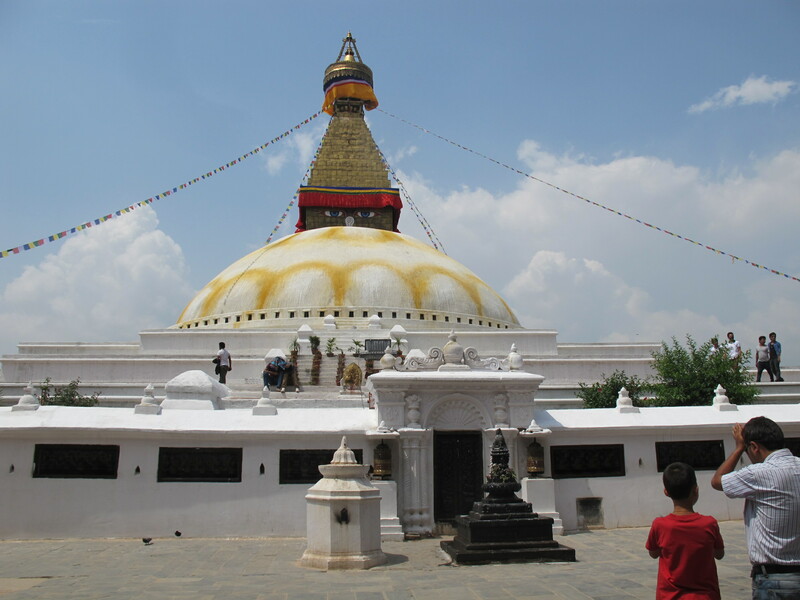 At the top awaits a giant Buddhist stupa, which is a mound-like or hemispherical structure containing relics, usually the ashes of Buddhist monks, common in places around the world touched by the Buddhist civilization. White as snows of Mt. 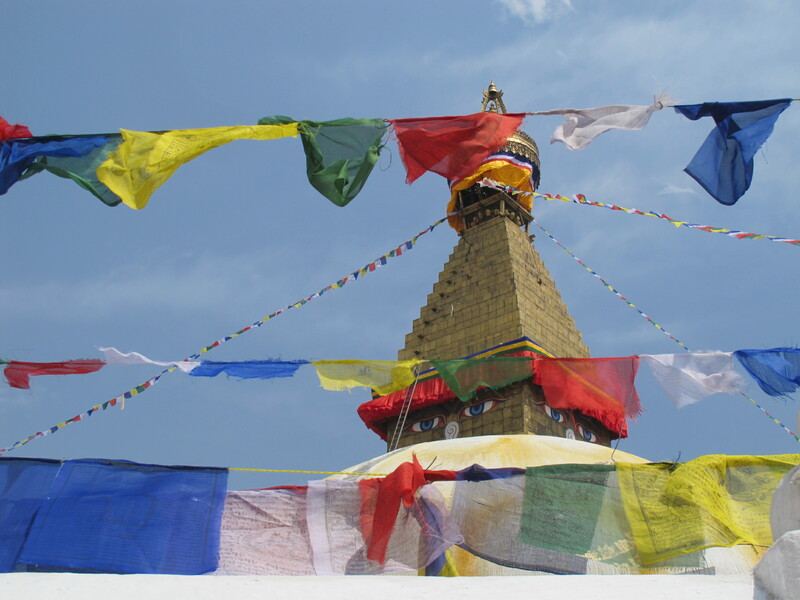 Everest, the stupa gleams against the blue sky surrounded by colorful Tibetan prayer flags radiating from its spire. 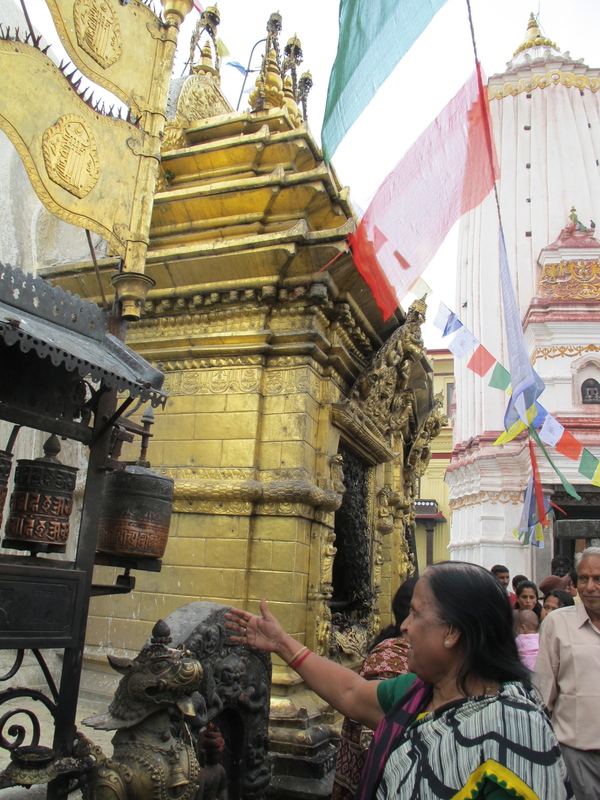 Prayer wheels repeat the sacred mantras as pilgrims circumnavigate clockwise the stupa’s large platforms. And wherever you turn, you can’t escape the watchful eye of the Buddha’s four faces casting their protective gaze in four directions of the Kathmandu Valley. 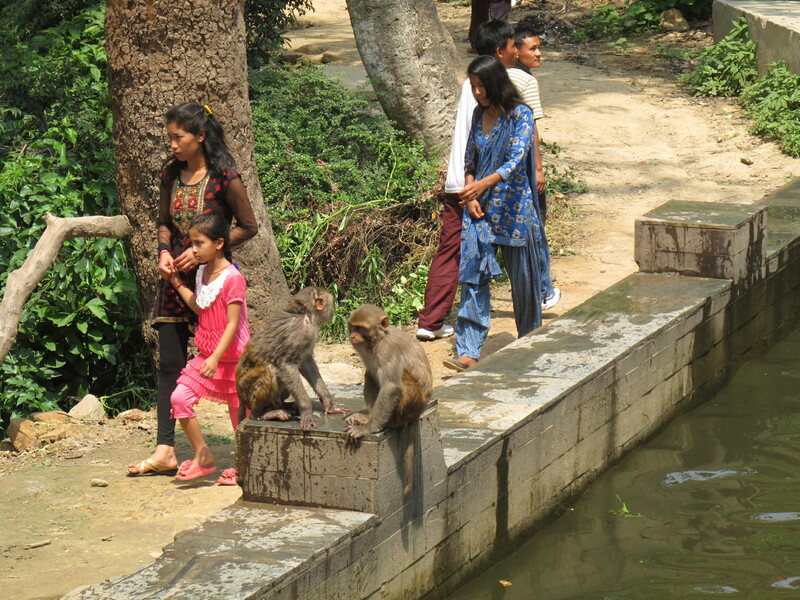 …Om mani padme hum… Only irreverent monkeys don’t pay attention, seeking instead a refreshing dip in the nearby pool. There is only one word to describe Bodhnath: wow! 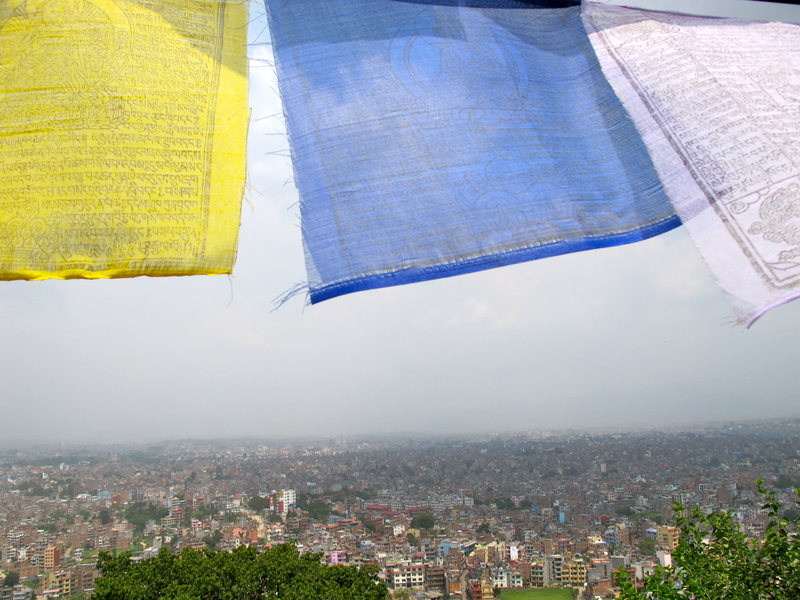 Is there a more beautiful fight than hundreds of prayer flags in the wind? 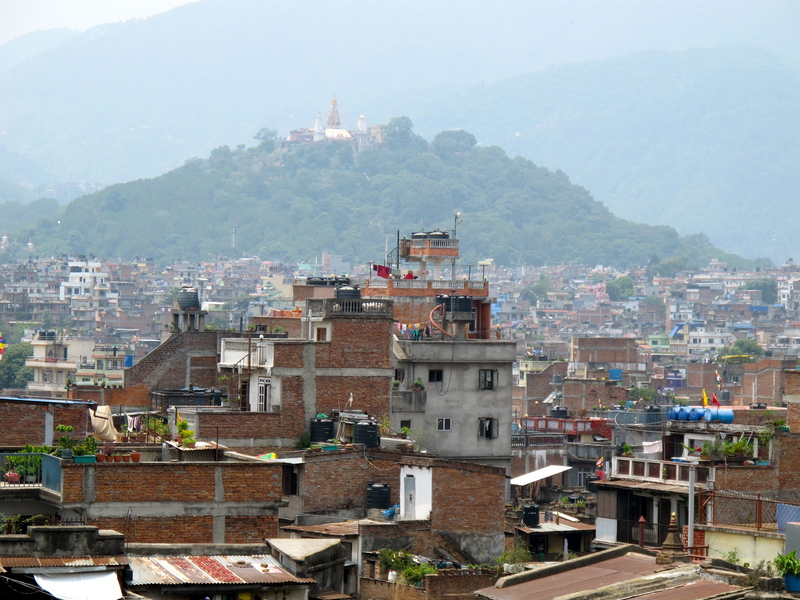 I also really liked this video I found on YouTube contrasting images of the old and the new in the Kathmandu Valley. 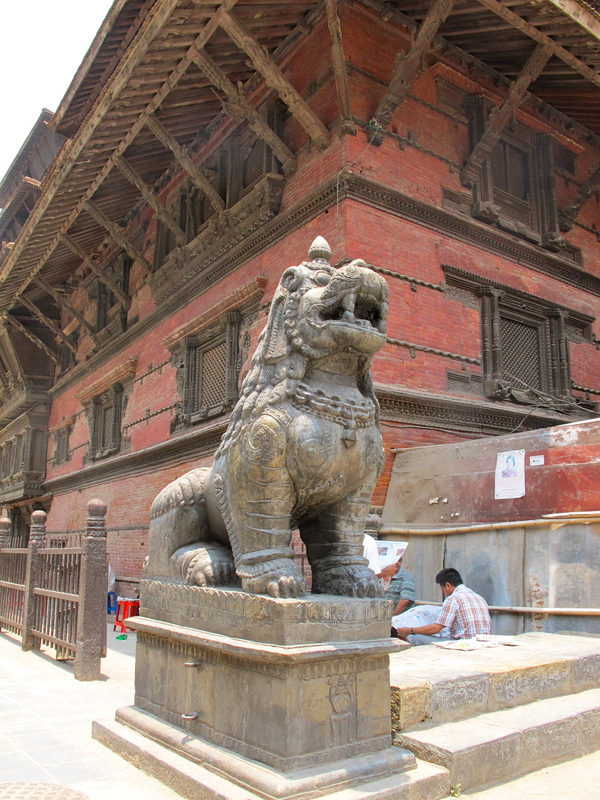 Enjoy and wait for parts 2 & 3 of this post devoted to Kathmandu’s sister cities of Patan and Bhaktapur!